As a coastal peninsula residing on the east coast of the United States, the state of Maryland is susceptible to a lot of flooding caused by heavy rainfall, nor’easters, and hurricanes. These rainstorms happen year round, and are known to cause damage to homes that haven’t been properly inspected and waterproofed. When a new home is being built, the building contractor needs to look over the basement and make sure that the room will not be exposed to dampness and flooding. If this is disregarded, the basement of the home can experience major damage, resulting in time-consuming and expensive repairs. For a home in Fort Howard, the situation is no different. This unincorporated community in Baltimore County is situated at the confluence of the lower Patapsco River, which flows into the Chesapeake Bay and the Back River, forming the east and south shores of the North Point Peninsula. If there are heavy rainstorms, there can be an abundance of water in the area. Therefore, it’s important to understand the causes of a leaky basement and the damages it can cause to your property. If you recognize any of these issues in your Fort Howard, Maryland home, the best course of action would be to contact a basement waterproofing contractor. In most cases, there are three main causes for a leaky basement in your Fort Howard home: condensation, runoff, and subsurface seepage. 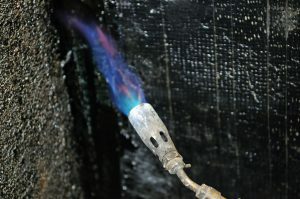 Condensation will occur when warm air circulates and connects with non-insulated water pipes or cool foundation walls. This results in the accumulation of water droplets, which can easily allow mold to grow inside your home. The second cause is runoff, which is attributed to rain water or snow that finds its way into the basement of your home. The best way to prevent this is by adjusting the ground surrounding your foundation so that it slopes away from your home. The last cause is subsurface seepage, which occurs when underground springs or water tables get too high, resulting in runoff. By checking water pipes, using dehumidifiers, and regularly cleaning out rain gutters and downspouts, you can help prevent a leaky basement from starting or getting worse. There are a lot of potential damages that can occur if you have a leaky basement in your house. This can include damages to furniture (if basement is used as a living area), discoloration of wallpaper/paint, warping of drywall and wood paneling, rusting of equipment, and the growth of mold, which can cause serious respiratory problems for you and your family. Damage resulting from a leaky basement can also find its way to the ground floor of your home, causing even more problems. If you notice any accumulating water or leaks/seepage around the foundation of your Fort Howard home, it is absolutely critical that you contact a local and reputable basement waterproofing company to inspect your property. A basement waterproofing contractor specializes in this subject and will know exactly how to handle your situation. A full-service waterproofing specialist will offer various methods to combat your problem, including external excavation, window well drain installation, exterior foundation crack repair, interior weeping tile system installation, sump pump installation, and polyurethane crack injection. While many general contractors offer these services if the opportunity presents itself, there are some risks involved if deciding to hire them. While it could be a cheaper route in some cases, an issue as serious as this requires expert analysis, and a general contractor more than likely will not have that total and complete knowledge on the basement waterproofing process. If the general contractor does the waterproofing job incorrectly, the problem may be hindered, but not completely solved. Basement waterproofing your Fort Howard home means that it is 100% waterproof. Being 85% waterproof mean water still enters your home, technically making it not waterproof. Once you decide to hire a basement waterproofing contractor, consider some of the following points. Does the basement waterproofing contractor you want to hire offer a full range basement waterproofing solutions? If so, these contractors can provide alternative, safe, and secure methods of waterproofing that may be able to save you money if your wallet is running thin. Some large basement waterproofing companies in the Fort Howard area may only sell proprietary products, limiting your options. A “one size fits all” approach is just not feasible considering the diversity and complexity of homes throughout the state and even the country. These proprietary solutions are usually not the best solution for your particular situation. In short, when hiring a basement waterproofing company for your Fort Howard home, make sure they offer many wet basement solutions in order to find the perfect match for your home’s situation. When dealing with basement waterproofing contractors out of state, they are most likely not aware of the local conditions that can affect you and your neighbors property. They may recommend a solution that may not completely fix your problem, costing an unnecessary amount of money and wasting your valuable time. You need a local, professional, and full-serviced basement waterproofing service for your Fort Howard home. Make sure to call one of these companies if you’re experiencing problems, and get rid of this issue once and for all!